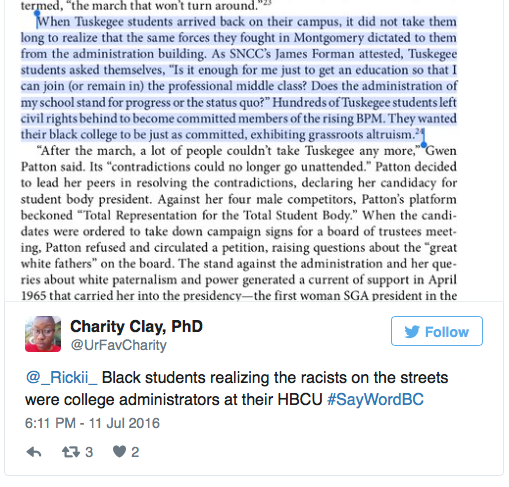 Dr. Charity Clay is a professor of sociology at Merritt College in Oakland, California. Her role as an educator reaches far beyond the hours that she puts in on campus teaching classes or at home grading papers. Charity has dedicated her life to uplifting her communities any way she can. One thing she does in her free time is maintain and facilitate the online Say Word Book Club. I’ve recently become very interested in the online book club community. I will be spotlighting book clubs that I am drawn to and visionaries that are able to bring people together. I like anything that encourages and enables people to read as much as possible. I love the idea of strangers around the country and world holding each other accountable and inspiring learning in one another. The first book club that I’ll feature is Charity’s Say Word Book Club. Below we discuss the benefits of hosting a club online, how she chooses what books to read and her future plans. She explains in more detail later in the interview but I would like to post here that you can join SayWordBC by emailing your twitter handle to saywordbookclub@gmail.com. I also compiled a list of all the books Charity mentions throughout the interview, which can be found at the end of the article. Enjoy! ShelfieGeneration: When did you start the Say Word Book Club and why? What were the major motivations behind it? Charity Clay: I started Say Word in 2012 as I was developing this idea of hip-hop education. I say all the time that for me, hip-hop, intelligence and knowledge have always gone hand in hand. One of the most influential texts for me as a grad student in critical sociology was The Root’s Game Theory album. I recall specifically that it was hearing references to books in hip-hop songs that really peaked my interest in the things that I would later go on to study. The first book we read was Derrick Bell’s Faces at the Bottom of the Well. I picked that because I first heard about it in the Black Star album – the song “Astronomy (8th Light)” where Mos says “black like faces at the bottom of the well.” I noticed that the book had always sat on my father’s bookshelf but it wasn’t until hearing it referenced in a hip-hop song that I actually picked it up. In high school I was introduced to this concept of racial realism, a concept that would later be the foundation of my scholarly work, so to speak, or my position as a critical race sociologist. The bigger reason is I was noticing a serious disconnect between popular rap music and the knowledge that had always been hidden. So I wanted to create a book club that connected social issues, history, and this amazing, scholarly knowledge to hip-hop culture as I know and live it. The reason I call it a hip-hop studies book club is because my work centers around the idea that hip-hop IS post-Civil Rights Black culture. Everything that informs post-Civil Rights Black culture is essentially hip-hop. We read Faces at the Bottom of the Well and Killing the Black Body: Race Reproduction and the meaning of Liberty by Dorothy E. Roberts. We read [Joan Morgan’s] When Chickenheads Come Home to Roost, Dax-Devlon Ross’s The Nightmare and the Dream: Nas, Jay-Z and the History of Conflict in Africa-American Culture, Frantz Fanon’s The Wretched of the Earth, Michelle Alexander’s The New Jim Crow, Jared Ball’s I Mix What I Like and Steve Biko’s I Write What I Like. Just trying to get people to understand that the themes that come up in hip-hop are being discussed by scholars, by academics, by intellectuals. SG: Can you tell me more about what the nuts and bolts of the book club? When do you have discussions and where? How did you choose that particular medium? CC: The book club functions on twitter. Every Monday, 6:00 PM Pacific Standard Time, we have an hour-long discussion using the hashtag #SayWordBC. To set up for that, I get a PDF copy of the book. I reach out to some authors and they’ve heard what I’ve been doing, so they offer me copies. I always tell users to buy a hard copy. What a lot of users do is they’ll screenshot me a receipt or a picture of them holding the physical copy and I’ll send them access to the PDF. The reason I use PDF copies is because, with only 140 characters on twitter when we are discussing a book, the digital copy allows us to screenshot and highlight text and share it with the other members. Because we’re not face-to-face where you can say “oh there’s this passage on page such-and-such” and read it out loud. So I use that to create an ability for us to digitally be on the same page. SG: How much do you read each week? How do you distribute assignments and reading material? CC: I send [the PDF] out then I send out a schedule. I try to limit it to one or two chapters each week because I really want to take time to discuss the themes and concepts that come out of books like these. I didn’t want to discuss something like The Wretched of the Earth in one discussion. I didn’t want to discuss The New Jim Crow in one discussion. So each weekly discussion only tackles one or two chapters. Sometimes I send out discussion questions. SG: How do you recap or follow-up after the Monday discussion? CC: I use Storify. Storify is a way for me to capture the discussion. Sometimes people are busy, or forget, or don’t get to tweet what they want. So I tell people to make sure they use the hashtag because afterwards I use Storify to go through and thread together a narrative or conversation that people who missed it can tap into. If they missed a discussion, they can go back and see what we talked about. One cool thing about Storify is, and a lot of people don’t know this but, you can comment on the post there to continue the discussion. So I look at the Storify and if there are any comments, I bring them into the Catalyst Cast. Catalyst Cast is a spreaker/podcast that I use to bring together this idea of hip-hop studies. It starts off with me recapping the discussion. I’ll go through and just kind of read the tweets and narrate the discussion that we had. I use the podcast to weave a narrative of the conversation. The second thing I do with the spreaker/podcast is play a hip-hop song. I play a hip-hop song that’s directly related to the content in the book we’re reading. So let’s say for instance, while we were reading Frantz Fanon’s The Wretched of the Earth, I would play Ab-Soul’s song “A Rebellion” or as we’re reading a chapter from Dax-Delvon Ross’ Nas, Jay-Z and the History of Conflict in African American Culture, I’ll play Jay-z’s “Dead Presidents” or when we are reading The New Jim Crow, trying to humanize young Black men that push narcotics, I’d play something like T.I.’s “Doing My Job.” The purpose is to always to acknowledge the fact that hip-hop culture is always a reflection, always a representation, of social and political issues that are happening. Unfortunately a lot of mainstream hip-hop music right now reflects only a small segment of life, primarily party culture. I want to make sure [it’s known] that everything that someone has written about in the most intelligent, scholarly way, that the same sentiment has been expressed by some MC in an equally eloquently brilliant way. So I always want to make the connection between hip-hop and education because they are one and the same. The third thing I do on the Catalyst Cast is I give my ‘two cents.’ My two cents is when I peruse the news, the conversations I have with people I know, the trending topics on twitter or what’s popular on my timeline and I just give my viewpoint on whatever issue is going on. It could be police brutality, it could be an awards show, it could be a statement that a public figure made. Whatever it is that I feel 140 characters on my twitter timeline isn’t enough, I’ll stick it in the podcast. I’ll connect it to the song and to the concepts of the book. So there’s the book club, the Storify recap and there’s also the Catalyst Cast that tie everything in together. SG: How do you choose what to read? CC: I take suggestions but I choose the books based on my feel of what’s needed for people to read. Like during Black August, we read George Jackson’s Blood in My Eye. It just makes sense, right? The book we’re currently reading is called The Black Campus Movement: Black Students and the Racial Reconstitution of Higher Education 1965-1971, considering all of the increased hostility that Black students are facing on predominantly white campuses, considering the conversations being had over the relevancy and need of HBCU education, considering the continued struggles of African-American studies programs to retain their funding and be recognized and be made a priority on college campuses. I just felt, especially since it’s summer and summer is a time that people forget about school, that reading a book with a very detailed outline and analysis digging into the Black student movement on campuses was just perfect. To reenergize people and give them a context of what we’re fighting for and what we’re fighting against. SG: What is something you have learned from running this online book club? CC: The biggest thing I have learned is persistence. When I started it in 2012, there would be discussions and I would be the only one tweeting, responding to myself and having these conversations with myself. But I noticed that people who weren’t responding were still paying attention. I think in social media, I guess we call them the lurkers; everyone is not vocal but people still are paying attention. Now e have about 25 participants, we have about 10-15 who are really devoted and always on-point with the book club. Another thing I learned, about myself, I am a very very meticulous person. [SayWord] has helped me in my interactions with my students, it’s helped me prepare lesson plans, it’s helped me be able to facilitate conversations and read where conversations are going, all of which is very helpful as an educator. SG: What is the biggest advantage to running a book club online? And the toughest thing to deal with? CC: The biggest advantage, for me, running it online is that I can do it wherever I am. Perfect example, I was in Minneapolis visiting my father for Father’s day. I was in the airport the whole day but Delta has Wifi on the plane and USB chargers under the seats and because I have a PDF copy of the book, I was able to run the SayWordBC discussion without a hitch. And the beauty is that when you have a digital copy of the book, it is on your phone and you potentially can have it on you at all times. The accessibility is great. The toughest thing is figuring out how to make sure that everyone feels welcome, that everyone knows how to contribute. A lot of times we lose a lot of great comments because people don’t’ use the hashtag and if you don’t use [it], I can’t find it when I go back. Here’s another thing, it has grown. There use to be a time when in addition to the #SayWordBC hashtag, everything was a direct response to me. People were always @-ing me. But now the conversations are so big that I’ll go back to do the Storify and there will be conversations that other members were having with each other, without me. That is one of the toughest things is not being able to know exactly who is there and what’s there. But that’s beautiful because that shows that it is growing past my direct reach, which is the goal. Everyone who is in SayWord doesn’t follow me and I don’t want them to feel that they have to [in order] to participate. SG: What are the future plans for the SayWordBC? Charity Clay: I haven’t really thought about the future. I don’t know. I would love for it to be as wildly circulated and as big on Twitter as something like when people live-tweet award shows. I would love to have that many people around the world commenting on the contents of a book. I don’t really have any big goals for it. I think the way it operates now is awesome. I would like to extend it to add some sort of face-to-face component. Maybe we could have face-to-face discussions here in Oakland and record or periscope those. And face-to-face discussions in Chicago, and London, Accra, you know, all around the World. Maybe have a face-to-face component where members who are in a common location can have a discussion in addition to the weekly online discussion that we have. I’d also like to start reaching out to younger people. I have some mentees that I’ve been working with since they were sophomores in high school and they jut finished their freshman year of college. A couple of them have joined the discussions. Now that you have me thinking about the future, I would like to ultimately create an app. You know an app where the Storify, the Catalyst Cast, the PDF, where everything is housed in one common place. There’s a page on my website, UrFacCharity.com, called Lessons where I put the recent episodes of the Catalyst Cast and the Storify but ultimately I would like to have an app that has everything SayWordBC does in one place. I love it. Hip-hop introduced me to books, introduced me to knowledge and any way I can share that, you know. If anyone’s heard my lyrics, I make references books probably more than anything. Maybe someone will hear me rap about a book and pick it up. Because that is what hip-hop is to me, that seeking self and world knowledge and this is an extended way beyond the microphone that I can contribute to that process. If anyone wants to join, send an email with your twitter handle to saywordbookclub@gmail.com and I’ll get you everything you need. We don’t know what the next book is going to be. For any of you that don’t know, I am a full-time professor of Sociology at Merritt College and I also coordinate our Sankofa Program for African descended students success. For updates on that and everything else I have going on, head to UrFavCharity.com.